At half past eight on April 24th, Barbara Mills received a loving text message from her daughter, Brittney. That was the last time Mills heard from her daughter. Later that night, a man came to Brittney’s apartment in Baton Rouge and within seconds, gunshots rang out. Brittney died in the hospital that night. As details of Brittney’s murder were made public, the case soon became embroiled in a national debate when investigators discovered a locked iPhone belonging to Brittney in her apartment. Police believed unlocking the phone would offer clues into the search for her killer. In September 2014, Apple announced that it would not be able to access devices running the latest operating system, iOS 8. Since Brittney’s phone was running iOS 8, Baton Rouge police were able to get metadata, including call lists and SMS messages sent, but not able to access the iMessages and other data that was not backed up to her iCloud account. The FBI says it has gained access on its own to the encrypted iPhone used by one of one of the shooters in last December’s terrorist attack in San Bernardino, California, so the Justice Department has dropped its demand to compel Apple to help unlock the phone. But the controversy is far from over. East Baton Rouge District Attorney Hillar Moore said there are as many as 80 phones that he is unable to unlock that he thinks could help investigators. And in jurisdictions around the country local prosecutors have the same problem. Still, privacy advocates worry that gaining access to individuals’ smartphones could set a dangerous precedent, compromising not only individual privacy rights but the entire digital security infrastructure. 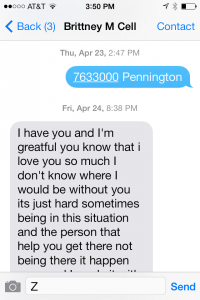 This heartfelt, urgent text was the last one Barbara Mills ever received from her daughter, Brittney. It was April 24th of last year. She said I have you and I'm grateful. You know that I love you so much, and I don't know where I would be without you. Hours later, at half past ten at night, someone knocked at Brittney's apartment in Baton Rouge, Louisiana, and killed her. It's like, has this really happened? And why? Police believe Brittney willingly opened the door. Another tenant overheard a man ask Brittney to borrow her car. And within seconds she was shot multiple times. The shooter left without stealing her car or taking anything from her apartment. Hillar Moore is the district attorney for Baton Rouge. Was there anybody else who overhead anything? Nothing. Were there any fingerprints? So there's nothing there to tell you who might've done this? Almost immediately after the shooting, the story became more than just a local tragedy, when investigators here at the apartment noticed that right inside the front door on a living room table, next to her keys and her purse, was her cell phone. And it was an iPhone. Eight months earlier, in September 2014, Apple had changed the iPhone's operating system, adding a new layer of encryption that made it impossible – Apple claimed — for law enforcement or the company itself to unlock anyone's iPhone without knowing the owner's personal pass code. In addition, a new security feature would erase all the iPhone's data if an incorrect pass code was tried ten times. With a warrant, Baton Rouge police obtained from Brittney's cellular carrier a list of who she had called and texted, but they could not get the contents of those messages…or read anything she had stored on her phone, including a diary that Brittney's mother says she kept on the phone. Well let's say she was having trouble with somebody. It could lead us to that, some person, somebody. It could tell us exactly what the problems were about. Almost a year later, the prosecutor has not charged anyone with the murder. Do you think the answer to who did it is on your daughter's phone? I think what's in that phone can lead them straight to the person. When she died, the pass code died with her. Cyrus Vance is also a district attorney, not in Louisiana…in New York, but he knows Brittney's case well. It's one of many cases around this country that present similar facts. Vance, who testified last month before a congressional hearing on encryption, has become a leading voice for local law enforcement officials. And it's local law enforcement, not national, which handles 95 percent of all criminal investigations in the u-s. Prosecutors in Houston have been locked out of more than 100 iPhones last year — 46 in Connecticut, 36 in Chicago since January. His own crime lab in Manhattan, one of the largest in the country, currently has 215 iPhones he believes contain evidence — blocked by Apple's encryption. Vance says a 2012 case demonstrates how important iPhone evidence can be. There was a homicide case we had not that long ago where a group of young men in northern Manhattan were at a gathering in a room, and one individual was actually holding an iPhone. When there was a noise, he turned to the door, entering the room, and in that door and captured on the iPhone in a movie was a man with a gun who then shot the man who was holding the iPhone — killed him, and that phone dropped to the floor. That model iPhone did not have the latest operating system and therefore was not encrypted. Police caught the suspect, with the iPhone video as evidence, convicted him of murder. If that had been an iPhone 6 operating with an 8 system, the pass code would have died with that man, too. It's never been about just iPhones. What we are talking about is the overall security of our entire digital ecosystem. Kevin Bankston is the director of the Open Technology Institute at the New America foundation in Washington. Some have framed this as a debate between security and privacy but that is a false choice. He argued before congress that while encryption may end up shielding criminals, it protects everyone else from criminals who wish to steal information or do harm. It's always going to be a tragedy to see a particular awful crime. But we need to think rationally about what will make us all the safest. And what will make us all the safest and keep most of us safer from crime is strong encryption. If there's a vulnerability in my smartphone– then it means my contacts can be exploited by some malicious third party. Many people store their passwords in their phone. My calendar, so someone knows where I'm going to be and when I'm going to be there. My movements, the G.P.S. log information, is in my phone. All of this could become available to malevolent– third parties- if there is a known vulnerability to the phone. Apple's new encryption is part of "the Snowden effect" – the desire by many telecom companies and Americans to protect their themselves from government intrusions…following disclosures in 2013 by former national security agency contractor Edward Snowden about bulk electronic surveillance. 58 percent of Americans said they are concerned about losing privacy in the government's efforts to fight terrorism in a CBS news- New York times poll last month. Vance says local law enforcement plays by a different set of rules. We don't do bulk data collection. We operate phone by phone, device by device. We go get a warrant for every device that we are trying to open, and we don't make those decisions ourselves. Judges make them. Even without the ability to access encrypted iPhones, Reidenberg says law enforcement is living in a "golden age for surveillance". I can't drive down the street anonymously now. My picture's taken at every street corner. My license plate is captured. And the government can tail me wherever I go. They could do it before, but they had to spend a lot of money to have a cop car following every citizen. Now it's ubiquitous, and it can be done on a mass scale. Despite the locked iPhone in the case of Brittney Mills, with Apple's help, Baton Rouge police were able to retrieve fourteen thousand pages of Brittney's emails and texts that she had backed up to the i-cloud, Apple's wireless storage service. Unfortunately, she stopped backing up her phone three months before her murder. Apple rejected Moore's request to unlock the iPhone and declined to give the NewsHour a statement. So if she actually was killed by somebody she knew, you probably already have that person's name in your call list. It's possible that we have that name in the call list, but apparently, on this day, from what we can tell, there's no potential killer that calls her phone or makes a text to her, outside of family members, mother, sister, that leads us anywhere. So I'm left kind of with the unknown. So they're hoping there's evidence there. But they don't actually know that the evidence is on the phone. They're looking. They're fishing. They're fishing to try to find something. There's certainly a legitimate reason for the prosecutor to wanna get access to that. The problem, though, is that what's decided in her case isn't limited to her case. It can affect people around the country in other kinds of cases where the circumstances will be far less compelling. District Attorney Moore wants information to help solve Brittney Mill's murder, but he admits he would like to use the tools to crack an iPhone in any number of cases. Yes, you want this information for a homicide. What about for a burglary? What about for shoplifting? Domestic disputes? I guess D.A. 's don't really draw that line? No, it's kind of, it's difficult to do so. So which victim is more valuable than another? You know, do you have a line? Well sure, if I'm going to have a shoplifter versus a murderer, I'm gonna take whatever I can get. However, I mean, every case is important to somebody for some reason. Moore supports a bill being drafted in the US Senate to give federal judges the power to order tech companies to grant law enforcement access encrypted data. Fordham law school professor Joel Reidenberg says everyone's privacy is at stake in how we treat alleged criminals. I think we also have to worry that if in pursuing them, we undermine the rights of the public at large. We begin to jeopardize some core values in our society. We presume everyone is innocent in the United States. Right, do we really want to reverse that and presume everyone is guilty? Yeah, we should have privacy. But to what degree? My goodness. And in our case we want this solved. But if you can't get into that phone, what are the odds you're gonna solve Brittney's murder? Well, if that's the case, I'd like for someone to come in and say, "I killed Brittney. I knocked on the door. Here's my gun. The ballistics match. It's not gonna happen. Could the remains of Queen Nefertiti be hidden behind King Tut’s tomb?